This was planned to be a trip down to the Anza-Borrego Desert Superbloom of wildflowers! But the combination of immense crowds, traffic jams, extremely windy weather, and 7 hours of driving led me to sneak away to the Palos Verdes Peninsula which is just 15 minutes away. I found wildflower blooms, wild peacocks, dogs, and horses to highlight a great pastel spring look! 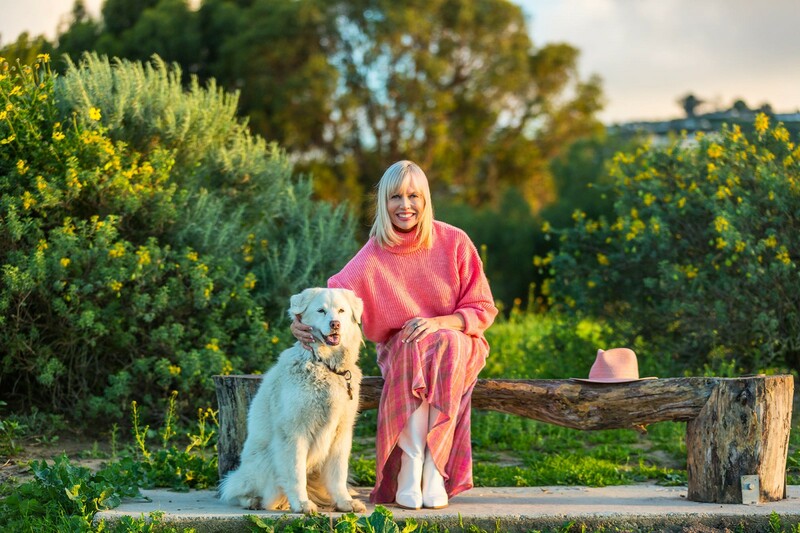 As I veer off in a fresh, new direction on the blog, one of my intentions is in sharing “wearable fashion” for the Modern Midlife woman. I seem to gravitate toward a handful of favorite looks and tried and true classics in my wardrobe. That’s where the idea of a “capsule collection” originally came from – a capsule collection is simply a well-curated collective of styles for every day. It’s those favorite looks you keep coming back to. You know, the ones you actually live in! Style is simply an extension of your creative expression. It’s wearing clothes, styles, and colors that make you feel beautiful. That’s my goal. To share my favorite looks of the season – the looks that I actually wear in my everyday life – and looks you’ll want to wear to make you feel your best. Does this look make me feel like me? Do I feel beautiful and confident in this outfit? Is this a look that’s super easy – one I don’t have to think about? Is this a color that I love and is flattering with my skin tone? Does this look flatter my body type? Does this look fit into my budget? An important part of Mastering Modern Midlife is making a look your own. Do you have curves and love to accentuate your waist? Great! Make sure to create a collection of fun belts to highlight that. Do you have extra long legs that always get noticed? Perfect. Find dresses and skirts that accentuate this feature. Are you looking to cover your tummy? Wonderful. Sweaters like this oversized pink one by Mango will do the trick. It’s roomy and comfy but without sacrificing style and with a snappy color that’s sure to make you feel vibrant and alive. Are you petite and wishing to make yourself look a bit taller. That’s easy. Stick to monochromatic looks to give you the illusion of height. Fashion isn’t about what others see. It’s about you and how you feel. You and only you! The moment we get caught up in caring what other people think is the moment we lose our ability to connect to the way it makes us feel inside. Intuitive Style is a new way of thinking about fashion. It’s style from the inside out. Style with only one metric – how does this look make me feel? If your answer is beautiful, that’s the only answer you need. If you’ve been following me for a while, you know affordability is really important to me. I was delighted to experiment with a new brand I’ve discovered over the past year: Mango. I love Zara, but Mango had been popping up time and again on my virtual searches. 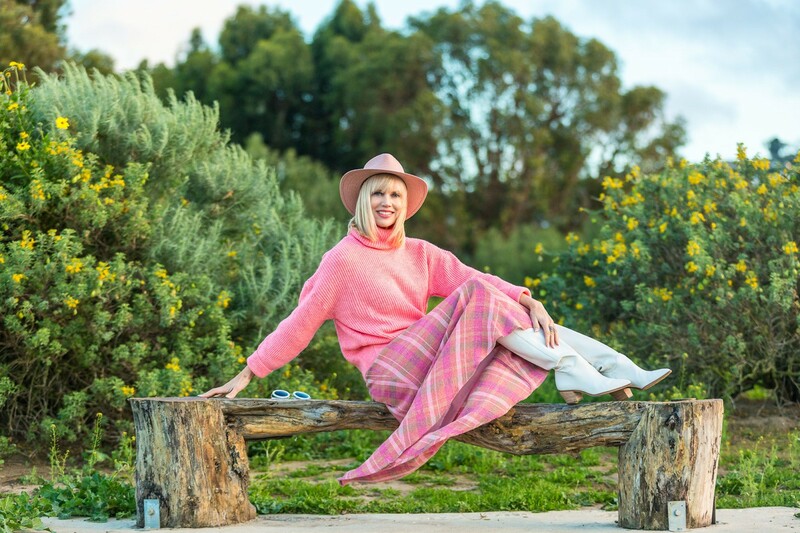 I combed the site and when I landed on this gorgeous pink sweater and plaid skirt, I knew I’d found a winning style. The look is ageless. It’s also flexible as you can mix and match the pieces with just about anything in your wardrobe. I paired the look with a pair of classic white boots by Steve Madden which made the colors pop even more. To change up the look, I tossed the sweater over a simple eyelet dress. It’s a trick that works with virtually any dress. I’ll always be a hat lover and hats serve double duty on windy days…and this was a day with 20 miles per hour wind gusts! I found this pink cowboy hat by Rag and Bone at Nordstrom. It will go with absolutely anything – from jeans to casual dresses and skirts. It’s a fresh take on a cowboy hat with the dusty pink color and textured fabric lending a healthy dose of femininity to the design. This is a look that will work for women of many different shapes and sizes. It’s also a look that’s bound to get you noticed unless you happen to be photobombed by the cutest white fluffy pooch who instantly takes center stage! When it comes to animals, almost any animal but especially dogs and horses, everything comes to a halt. CGO does love her photo bombers! You can’t go wrong this spring or overdose on pinks and pastels. At least, not in my fashion book! Stay tuned for next week as I found another amazing look that’s classic with a twist. It’s an unusual color for me but the only way we know what works with color is by experimenting. Mastering Modern Midlife ultimately means mastering you. It means diving into some self-discovery and reconnecting to your intuition. What young girl doesn’t love playing dress up? Connect to that younger self within, that young one who was a bit more wild and carefree…she’s right there waiting for you! What’s your favorite Midlife style tip? Cheers Beauties, Stay Fierce! Better late than never sister!!! Beautiful and your tips are spot on! Thank you sister. I do love sharing my philosophy. It’s so important to feel good in what we wear. We spend most of our lives in clothing. Why not bring our personality and energy to it? I had to laugh, as I, too, planned to go to Anza-Borrego and take some shots with the flowers. But the big crowds have kept me from doing so, so I often take shots around our neighborhood where lots of flowers are sprouting! I LOVE your mix of pinks. The Mastering Modern Midlife initiative is truly inspiring. Teehee. I feel as though I got the best of both worlds. Wildflowers and a restful weekend. Thanks so much for your wonderful support of MMM!!! 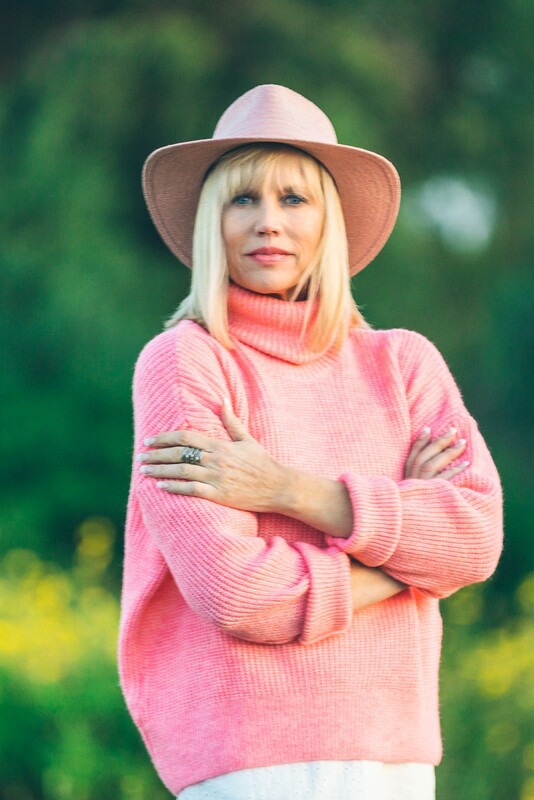 I love pink and those are bargains and ready for our “capsule collection.” I love wearing hats as I want to protect my skin as much as possible. I have chosen many hats that are French girl, like Helen Kaminski with a girlie bow in the back and loving my brand rag and bone hat from your collection. Love these choices of yours and I need to try the white boots style. Your are one adventurous stylist and always rocking midlife. Thank you lovely sister. Hi sister! Isn’t it such a fun look. I do love both the ease and comfort and the gorgeous color! Thank you for following along! That puppy is the best accessory!! I couldn’t have picked a better one if I tried! And, cheaper than thrifting!!! Well I love that look on you! I’ve seen Mango pop up on my screen before, but have never tried it! I will have to check it out! I love your questions too that help you get a handle on what you really want your closet to have in it. I love the direction of your blog you are taking. I need help in that department. So glad I’m taking a deeper dive. It’s definitely going to be shown time and again.